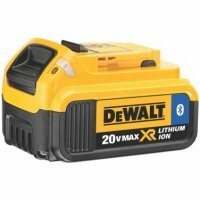 It will now be easier than ever for 18V DeWalt Cordless Tool users to find higher capacity batteries with lithium-ion technology, all thanks to DeWalt’s new DCA1820 20V to 18V battery adaptor. 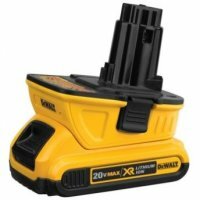 The new battery adaptor will allow most of DeWalt’s 18V Cordless Tools to function off of Lithium-ion battery’s from the newer DeWalt 20V Max system. 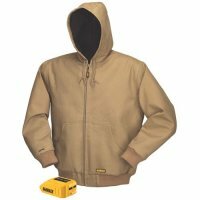 Oftentimes it can be a battle to find an empty power outlet on a busy jobsite, so it is probably a dream of many tradesman—not just myself—to be able to go completely cordless with their power tools. 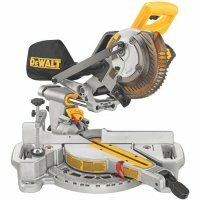 DeWalt is taking their users one step closer to this dream with the introduction of the new DCS361 20V Max 7-1/4 Inch Sliding Single-Bevel Miter Saw. 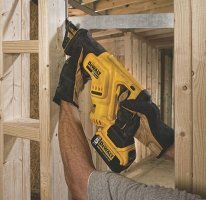 DeWalt wants drywall carpenters to Get More Done, thanks to their new DCF620 20V Max Brushless Lithium Ion Drywall Screwgun with Extended Runtime battery packs. The combination, they say, is what professionals need to get the job done without the hassle of long extension cords. 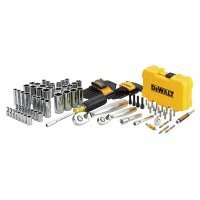 Recently, at the GIE Expo, DeWalt announced that in March of 2015 they will be coming out with a new line of 40V Max Outdoor Power Tools. 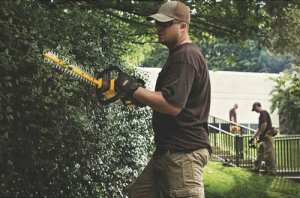 The Line will consist of both 4.0Ah and 6.0Ah 40V Max Brushless String Trimmers, Brushless Blowers and they will even have a Hedge Trimmer available. 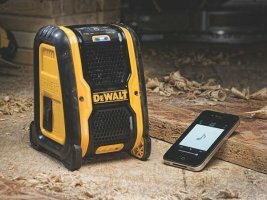 DeWalt is coming out with a new 20V Max cordless reciprocating saw that is more compact to allow remodelers, carpenters, plumbers, electricians, and the like to make controlled cuts in tight spaces such as between studs, or in crawl spaces. With reciprocating saws, sometimes smaller is better. 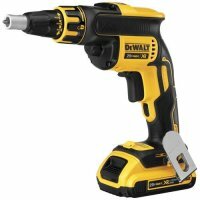 DeWalt has come out with a new line of air tools for professionals in the automotive industry. 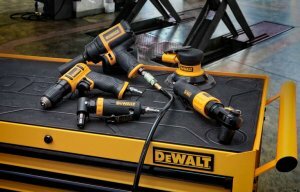 DeWalt says they have been engineered to meet the high-end performance standards demanded by tradesmen and they include features that ensure they can take as much as they can give.